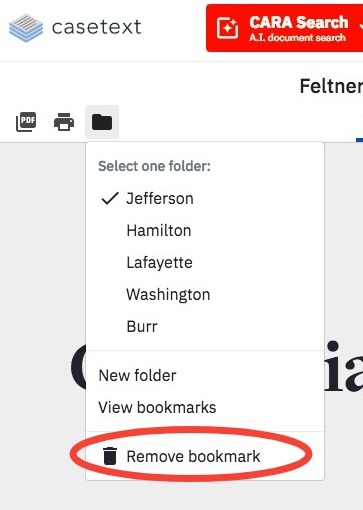 There are two ways to remove a bookmarked case from your bookmarks: on the case page itself, and the "My Bookmarks" section of your account. For information on bookmarking cases, visit this page. If you've bookmarked a case, the folder icon in the upper left corner of the case page will be green. Click on the icon, then click Remove Bookmark from the drop-down menu. Deleting a Bookmark from "My Bookmarks"
You can access your bookmarks by clicking on your initials in the upper right corner of the screen, then clicking on My Bookmarks in the drop-down menu. Click on the arrow to the left of the folder name to open it. Then click on the trash can icon to the right of the case name.